Newfoundland & Labrador. Nova Scotia. Prince Edward Island. New Brunswick. Quebec. Ontario. Manitoba. Saskatchewan. Alberta. British Columbia. 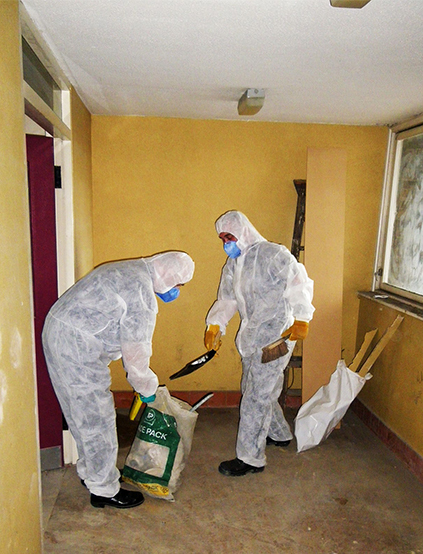 Crime & Trauma Cleanup Services FREE! Crime & Trauma Scene Cleaners offers nationwide service and training for the safe, effective, clean up and proper removal of Biohazardous Infectious Materials (WHMIS CLASS D, DIVISION 3) including blood cleanup, body fluid and tissue removal from any type of crime scene including homicides, suicide, accidents, unattended death, or auto accident. We will properly remove, disinfect and dispose of all contaminates an "Pathological Waste" in accordance with the Canadian Environmental Protection Act Regulation 347. Crime & Trauma Scene Cleaners recognizes that our services are usually needed during unpleasant and often tragic circumstances. For this reason, we continually strive to provide you with the most professional and courteous services at all times. Our diligence and professionalism is very important to us. Crime & Trauma Scene Cleaners is equipped and ready to respond 24 hours a day, 7 days a week, 365 days a year. Once dispatched to a scene, whether it is residential, industrial, or commercial, our trained specialists will assess the situation and once the arrangements have been made, Crime & Trauma Scene Cleaners will immediately begin the decontamination process. Our specialists are trained in the proper removal and packaging for disposal of all Biohazardous Infectious Materials (WHMIS CLASS D, DIVISION 3). All Pathological Waste as per Regulation 347 is disposed of through a federally licensed medical waste transporter. Lastly, if additional evidence is subsequently discovered, our specialists are trained how to approach and preserve the scene. When responding to a crime or trauma scene, a clandestine methamphetamine lab, or a gross filth environment, the first responders and the individuals of businesses contracted to decontaminate the site will be exposed to bloodborne pathogens and chemical hazards. These chemical and biological hazards consist of Hepatitis, HIV, TB, Norovirus, Staph, airborne Hantavirus, various bacteria, and various chemical pollutants. Our service area consists of the following provinces; Quebec, Ontario, Manitoba, Saskatchewan, Alberta, British Columbia. If you are outside of these areas, we have associates we can refer to your location. In our own way, we try to bring a little light into the darkness, while honoring and respecting each and everyone's individual beliefs and rights.